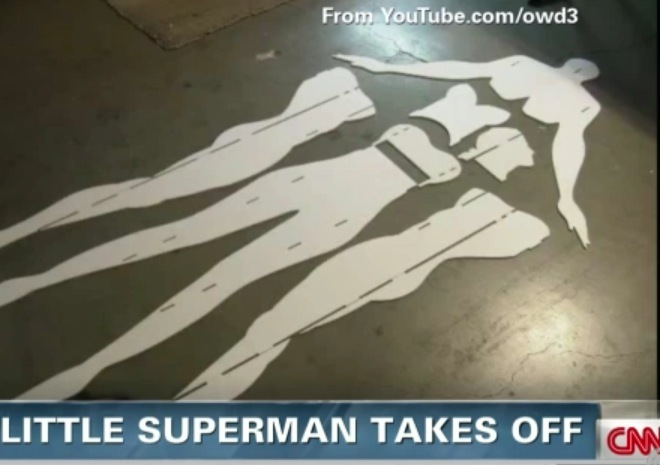 We may only be a few days into 2013, but Superman isn’t just a character in a film, an action figure or a life-size poster anymore. Now he’s flying from our fingertips. Just before the New Year, a cyclist in southern California was riding with a friend when he stopped to shoot footage of Superman flying past him. 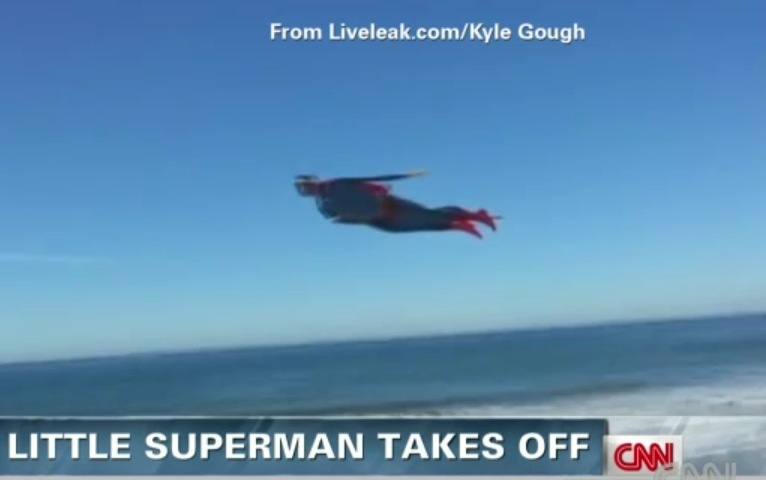 “I was cycling with my buddy down PCH (Pacific Coast Highway) and during our casual conversation … Superman flew by,” Kyle Gough wrote above his now-viral video. The video now has more than 183,000 views and almost 10,000 shares. Flyguy/Flygirl has a top speed of 30 mph, is 5’2” in length and weighs just under 2 pounds. He is propelled by an electric motor hidden in the body of the flyer, with the battery located on his head. And now he and his business partner — recently featured on HLNTV’s Morning Express with Robin Meade — explained that they intend to launch a business selling slightly smaller remote controlled figures for under $500 each. The buyers would be able to assemble their own flyguys, giving them their own heroic features as they please. So don’t be surprised if sometime in the near future, you hear a cape flapping in the wind or see a 5-foot man propel past you.